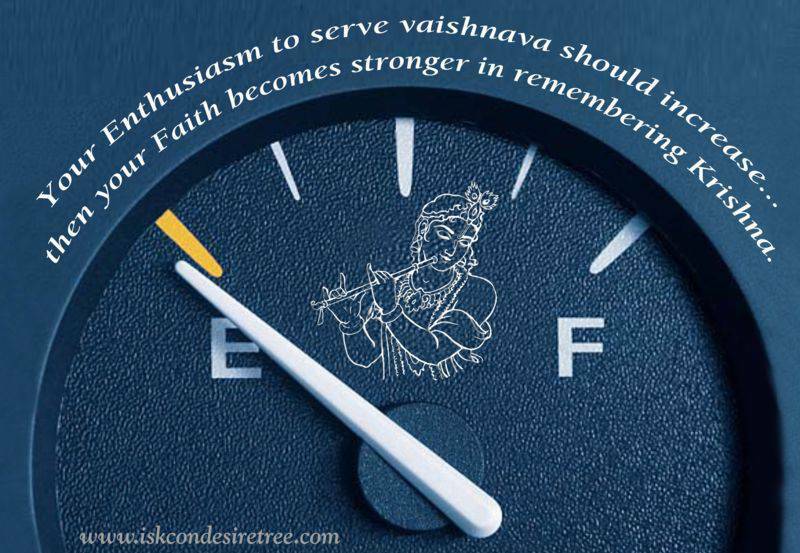 Your enthusiasm to serve vaishnava should increase.. Then your faith becomes stronger in remembering Krishna. Our first duty is to satisfy the spiritual master, who can arrange for the Lord’s mercy. A common man must first begin to serve the spiritual master or the devotee. Then, through the mercy of the devotee, the Lord will be satisfied. Unless one receives the dust of a devotee’s lotus feet on one’s head, there is no possibility of advancement. Unless one approaches a pure devotee, he cannot understand the Supreme Personality of Godhead. To serve devotee means my Happiness in their happiness and that is real service attitude.